Ayr, Boroughmuir, Heriot's, Melrose, Stirling County and Watsonians have been chosen as Scottish Rugby's new semi-professional franchises. The new Super 6 league set-up is designed to bridge the gap between the amateur and the professional game. 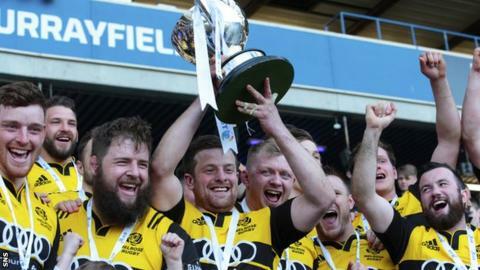 Scottish Rugby hopes to have the new league up and running for the start of the 2019-20 season. But the list has been criticised by Glasgow Hawks because "Scotland's largest city will not be represented". The six clubs, chosen from 12 applicants, all presently play in the Scottish Premiership and will act as feeder clubs to Pro14 outfits Glasgow Warriors and Edinburgh. Hawks, Currie Chieftains, Dundee, Edinburgh Academicals, Gala and Hawick were unsuccessful in their bids. A review panel had been tasked to choose at least one team from the four Scottish regions - Caledonia, Glasgow and the West, the Borders and Edinburgh and East Lothian. Edinburgh has three representatives, Ayr represent the west, Stirling are Caledonia's representatives, while Scottish champions Melrose are the only team to represent the traditional rugby stronghold in the Borders. "It is profoundly disappointing that Scotland's biggest city will not be represented in this new structure," Glasgow Hawks said. "The commitment offered by Glasgow and Strathclyde Universities, the Royal Navy in Scotland and three long-established rugby clubs did not find favour on this occasion. "It is our earnest hope that the goodwill of these organisations might be harnessed by an alternative body to ensure that the city of Glasgow has a platform for the best available club talent to develop in a professional environment." Currie, who were runners-up this season, said they were "bitterly disappointed" but would "continue to pursue our objective of being the best rugby club in Scotland". Dundee High said they were disappointed considering they had formed a partnership with Abertay University, the University of Dundee and Dundee City Council. Sir Bill Gammell, who chaired the independent review panel, said: "I believe the advent of Super 6 is an exciting, forward-thinking evolution within Scottish rugby." The governing body will now form a working party with representatives from each franchise to agree on a format for the competition. Chief executive Mark Dodson said: "The six successful applications will, I believe, enable Super 6 to achieve our ambition to raise the standard of rugby at the top of the club game in Scotland and also create strong, sustainable franchises in their own right." Scottish Rugby hopes that, in addition to league fixtures, the new clubs will be able to participate in a new cross-border competition with Irish and Welsh clubs. "Ayr RFC are excited to have achieved Super 6 status and looking forward to playing in the new set-up and, in particular, the cross-border competition as Ayr are the only Scottish team to have reached the quarter-finals in the B&I Cup." "We at Boroughmuir are delighted to have been awarded a Super 6 franchise. We firmly believe that the community-based vision at the core of our bid will serve rugby well, and we look forward to starting the tournament in 2019-20, the club's centenary season." "Heriot's Rugby Club is delighted to have been selected to participate in the Super 6 tournament. By working with George Heriot's School, Stewart's Melville Rugby Club, Edinburgh College and throughout the community we will also provide a platform for all rugby players to reach their potential within the game." "Melrose Rugby is delighted to be rewarded with one of the Super 6 franchises. This opportunity to support bridging the gap between the club and professional game is something Melrose Rugby has worked tirelessly to do since the game went professional in 1997. Edinburgh Napier University will play a pivotal role in further bridging this gap and we are delighted to be working in conjunction with them." "Stirling County are delighted to be selected as one of the inaugural Super 6 clubs for season 2019-20. We look forward to working with our franchise partner Stirling University, the other Super 6 clubs and Scottish Rugby on the next phase to ensure a successful launch of the tournament." "Watsonian FC is delighted to have been awarded a franchise in the new Super 6 competition, which we believe will play a huge part in enhancing the development of elite rugby in Scotland. We also welcome the opportunity of working with other clubs in Edinburgh, and further afield, to provide the pathway to elite rugby for their talented players."